Choosing to ride a skateboard for fun or to get from A to B can be convenient, but it can be more so if you own some skateboard backpacks. Many young people choose to skateboard to their destination because it enables them to get there far quicker by cutting through alleyways and parks rather than using public transport. You can get in that much-needed exercise as well, all the while having a little fun. However, when you get to your destination, what happens next? Or, if you have to jump on a bus or a train, what do you do with your skateboard or longboard? Skateboard backpacks are going to be a convenient addition. You can wear it on your back, add your skateboard when you’re not using it, and it also has enough room for other items as well. Therefore, you do not have to fill your pockets up to carry everything with you. Skateboard backpacks can also prove helpful for reducing fatigue. If you have to carry your board for extended periods, it can get heavy quite quickly. A skateboard bag removes that problem entirely. If you want that convenience for yourself, you can check out these options below. 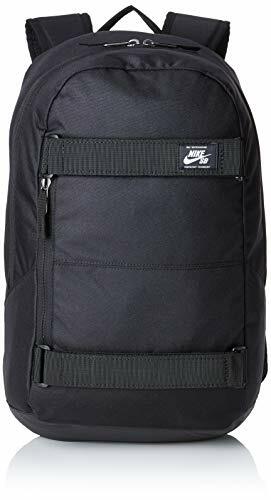 Because you’re only going to be using a skateboard backpack when you’re not using the board, it would make sense for you not to want to spend a lot of money. However, you will also be wishing for a skateboard backpack that won’t fall apart as soon as you insert your board. You are going to find this bag from Maxfind meets the mark for both its competitive price tag and quality. It features robust Oxford fabric which can handle a significant amount of wear and tear, as well as rugged zippers that are built to last as well. What’s more, it’s an entirely versatile bag, given that it can suit skateboards with a length of up to 27 inches. However, the benefits don’t end there. Skateboards can be massive, so Maxfind has added ergonomic straps which balance the weight of the board across both shoulders evenly. It even has a convenient pocket for anything you need to carry alongside your board. Owning a skateboard backpack is convenient as it allows you to keep your hands free for doing other things. However, the downside is, that backpack is only suitable for your skateboard. Therefore, it sits doing nothing when you’re not transporting your board around. However, if you want a skateboard backpack that’s a little more versatile than most, this one is it. You can use this backpack for everyday use – be it going to school, work, or on outdoor adventures. It can house all manner of items within the central and front pockets, all the while featuring D buckles and drawstring closure. However, the benefit is, the fasteners are in the right place to comfortably house your snowboard or skateboard as well. All you need to do is slip your board through the buckles and benefit from a seamless transportation approach. Whether you’re cycling, walking, or trekking, you will find this feature, and the bag itself is exceptionally convenient. If you own a mini cruiser skateboard, you will soon be on the lookout for a backpack to match. After all, when you’re not riding it, how are you supposed to carry it around? 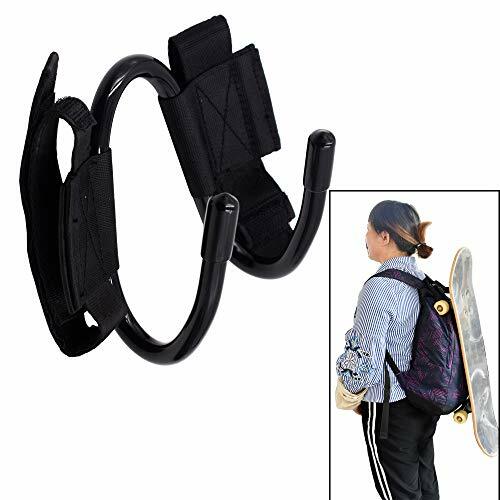 It can be a pain to house it in your arms when you have other items to take with you, so it might be time to take a closer look at this Skitch Universal skateboard backpack. Catering to all those mini cruiser owners, it’s a high-quality, yet affordable backpack you will find adds a lot of convenience to your life. What’s more, if you buy a Skitch skateboard gift set, you get the bag for free. 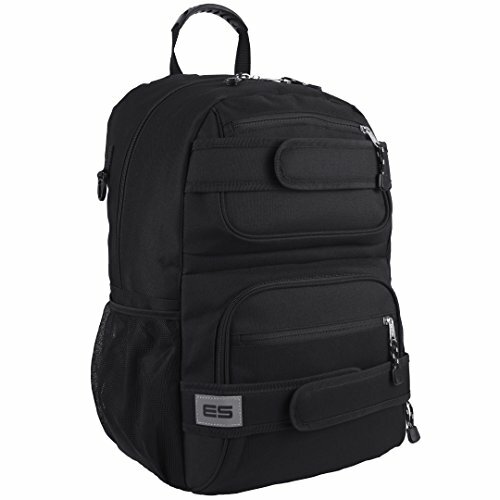 What users also like about this backpack is the versatility. You can wear it as you would a regular bag, or you can put it over one shoulder or across your chest. This skateboard backpack will be comfortable no matter how you wear it. Then, when you no longer need it, it folds down and compresses nicely for effortless storage. There are several styles of skateboard backpack on the market, but many of them only cater to regular skateboards and small sizes. If you have a professional-style longboard and also wear safety gear, it can be hard to find a bag to suit those needs. Lucky for you, YOYOSTORE cater to that requirement. Even though the bag is not stylish or branded, it’s an entirely functional unit that has more than enough room for your longboard or skateboard, your accompanying gear, and everything else you need to carry from A to B. Where this skateboard comes into its own is when you need to travel on public transport to get to your destination. Because you need to utilize handrails and carry tickets, you want to be able to keep your hands free. This lightweight bag enables you to carry your gear securely on your shoulders while not feeling unbalanced or uncomfortable. With the shoulder straps, the weight distributes evenly, so you’re comfortable at all times. If you’re in the market for an affordable and entirely convenient skateboard backpack, this one should be well worth your consideration. 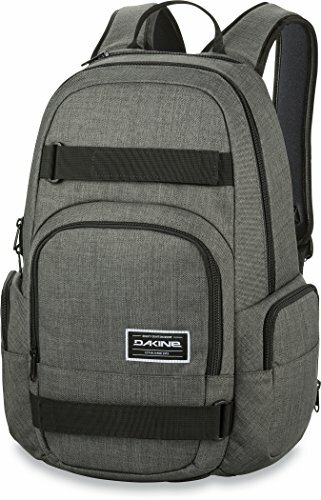 Even though most people buy a skateboard backpack for how functional they are, it’s always nice when they are attractive as well. After all, you don’t want to be seen with an ugly backpack, do you? Therefore, if you want a bag that will be suitable for a longboard or skateboard, but also ticks all the boxes for style, it’s in your best interests to look at this one. You can wear it on one shoulder or both to distribute the weight evenly, and it arrives in a stylish black color. Therefore, it’s sleek and elegant in its design for your benefit. What’s more, it’s made of robust, waterproof and durable 500-denier canvas. As a result, it’s more than equipped to handle everyday wear and tear. However, the benefits don’t end there. You can adjust the length of the bag while benefiting from the additional room for your safety equipment. 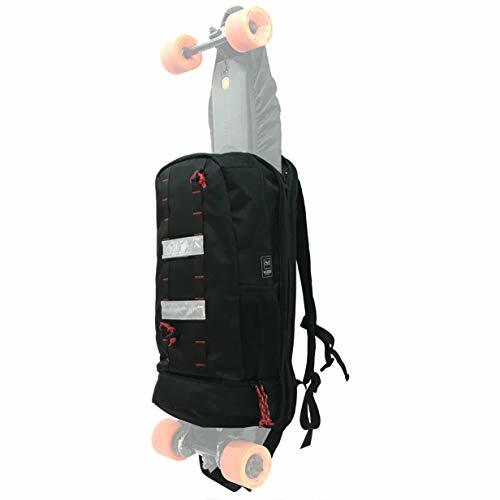 This skateboard backpack is suitable for skateboards between 28 inches and 33 inches. Don’t wait to benefit from convenience, get it now with this skateboard backpack from DreamFire. 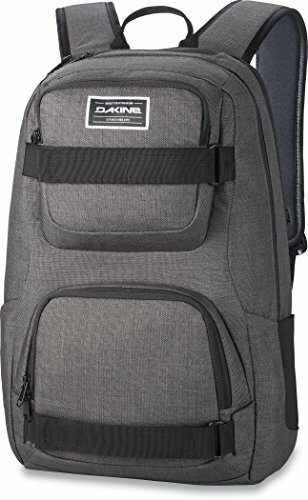 If you’re tired of coming up short every time you try to find a skateboard backpack that’s large enough, then set your sights on this bag from USDisc’t. As a spacious skateboard backpack that caters to both longboards and skateboards, it could be the very thing for which you’ve been looking. When it comes to durability, it has you covered here too. As it features Oxford fabric, it’s suitable for everyday use – handling wear and tear with ease. What’s more, it’s 47 inches in length, which is more than ample for a board up to 46 inches in length. As a result, it’s going to cover most bases. It comes with a three-month warranty, it’s comfortable to wear, and it also has enough room for your safety gear as well. Therefore, if you find yourself needing to travel on public transport, or in areas where you can’t ride your board, you can pack it away and keep your hands free. It has never been easier than now to transport your skateboard in public spaces. 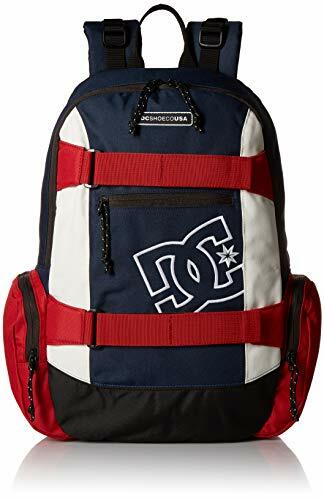 The market is full of various skateboard backpack options you are sure to find tick all the boxes for your requirements. However, sometimes it doesn’t seem natural to carry around a large bag with your skateboard or longboard entirely covered. 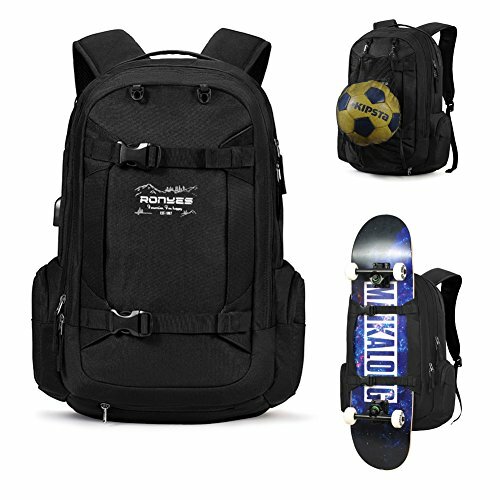 If you would prefer something a little more compact and versatile for other uses, this SKATE HOME skateboard backpack could be a valid option for you. Rather than buy a large bag which you can’t use for anything else, this backpack will have many uses. You can use it to take to work or school, or even on trips into town. However, when you need it to house your skateboard, it will do so with ease. It’s able to carry your board thanks to the robust top and bottom strips which sit tightly around your board. You then put your bag on your back and benefit from the knowledge your board is firmly in place. However, the benefits don’t end there. There is a large pocket for items you may need to carry alongside your skateboard, as well as a smaller pocket too. When you put it on your back, you also benefit from the two adjustable and padded straps which balance the weight of the skateboard out evenly. If you’re looking for a skateboard backpack that bucks the trend in more ways than one, you will enjoy everything this bag from Porlik has to offer. Not only is it affordable so that more longboarders and skateboarders can enjoy it, but it’s different from most other backpacks on the market. The first noteworthy feature is the color. It’s a vibrant yellow hue which helps you to stand out from the crowd. What’s more, it has so many features you will appreciate. You can use it as a skateboard backpack, or a regular bag when you don’t have your board with you. 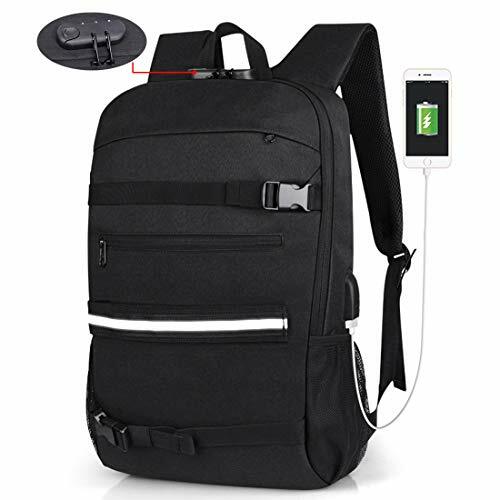 You will also enjoy the comfort of the mesh shoulder straps, as well as the various pockets for mobile devices. At the back of the bag is also a select area for your skateboard to sit snugly. Once you purchase this bag, you will never be without it. It’s a unisex utility backpack with so many uses and is well worth further inspection. If you want to look cool as you transport your board around in your skateboard backpack, this one from Porlik is the answer. Finding a bag that’s cool and convenient is hard, but it’s not impossible. You will see this one ticks all the boxes for your needs and more. It’s available in a sleek black color, features striking white branding, and is affordable as well. What’s more, it’s a well known and quality brand that meets the mark for street credit. However, you will also appreciate that a lot of time has gone into the creation of this bag to ensure it’s high-quality for long-term use. You can benefit from robust and high-quality fabric, a comfortable and well-balanced mesh shoulder strap, and a spacious storage compartment with an accessory pocket. Because it has velcro, you can also carry a vertical skateboard or longboard, as long as it’s under 41 inches in length. Don’t settle for less than the best when you can arm yourself with this convenient skateboard backpack from Porlik.